Although I paid a brief visit to Prudhoe about three years ago, this is the first time that I have travelled the length of the Tyne Valley Line since the early 70's, so I am quite excited by the prospect. We leave from platform 6 of Newcastle Station going in a westerly direction. There are 12 platforms at Newcastle station with mainline trains going to such places as London, Edinburgh, Liverpool, Penzance and Southampton. My service is an hourly train which goes semi-fast as far as Hexham, before stopping at all stations to Carlisle. There is also a stopping train to Hexham which leaves Newcastle at 54 past the hour, plus another two trains in between which go as far as the Metro Centre. The train I get has less than ten passengers on board and leaves on time, going over the King Edward railway bridge, with the Metro line bridge on our left and the A189 on the right. We then join up with the line from Gateshead coming in on left and then we travel parallel to the East Coast Mainline on our right for a short while, before descending into a cutting and then going underneath it. We continue downhill and curve to the right passing factories on the left and semi-detached houses on the right. We continue to curve slowly to the right passing some high rise blocks of flats on the right, and rough scrub land on the left. We pass over the A184 and then slow to about 20 mph as we pass through Dunston station which has an island platform, with a single blue-coloured brick shelter in the middle. At present only two trains a day stop here in either direction. We then speed up; passing several traditional racing pigeon sheds on the right, before going into a low cutting. There are factories on the left and the right as we start to curve towards the left, before slowing down as we come into the Metro Centre station. 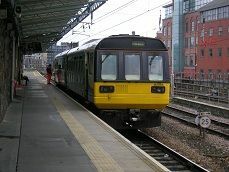 It is the newest station on the line, being built specially for the North East's biggest shopping centre in the 1980's. Both sides have large glass fronted waiting areas and around fifty people get on the train here. Surprisingly most of them go all the way to Carlisle; such is the pull of the Metro Centre. As we leave, we pass several out of town retail units on the left and have the river Tyne right next to us on the right, the first of several times it runs next to the railway line. There are plenty of houses on the left as we go under the A695 and then it's factories on both sides, before we pass under the A1 as it turns to go north. We pass even more factory units on both sides, before passing through Blaydon station, which has a blue brick shelter on the right side, and the original cast iron footbridge, painted in maroon. Just before Blaydon station, the line originally crossed the Tyne here to continue to Newcastle Central, but once the Metro Centre was built, this line was removed in favour of the present route. The river Tyne is right next to us again on the right and we speed up to 50 mph, as the B6317 runs parallel to us on the left. We pass the last of more factory units, before we are finally out into the countryside. There is a small hill on the left, which the railway clings to, whilst on the right is scrub land. The Tyne joins us again before moving away to make way for a golf course on the right. Wylam station is next, which has split platforms and the familiar cast iron footbridge. Soon after the station the river Tyne joins us again and this time there is what looks like a mini-Tyne Bridge, painted white across the river. It looks disused but is a cycle and walkway and originally carried another railway line to join up with the original Newcastle to Carlisle route. The cottage where George Stephenson was born is also near here. We continue along a section of non-welded track for a little while, before we pass more industrial units on the left, including a water treatment works and a large warehouse. We then come to a stop at Prudhoe, which has semaphore signals here and a very tall signal box on the right. There are two dark blue glass shelters on each platform, as well as a red and white coloured footbridge. Prudhoe Castle can be seen on top of a hill to the left. The land is still fairly flat here, but gently rolling hills can be seen in the distance on both sides as we start to climb, with the river Tyne on our right once more. We are going at a steady 40 mph as we see sheep grazing on the right for the first time. We then pass through Stocksfield station, which has a large brick shelter built into the hillside on the left and a smaller shelter on the left. The A695 is below us on the right now and it gets more hilly. We move onto an embankment and speed up to about 60 mph, before entering a cutting and then we pass under the A68. We pass through Riding Mill station, with blue coloured shelters on both platforms and the original station house on the left, now in private ownership. The Tyne appears on the right again as we then pass through a wooded area. There is an old tunnel of single bore on the right, where the original line went, but it now looks like it is used as a footpath. Soon after, we pass several rugby pitches on the right, which belong to Tynedale Rugby Football Club. Then we pass through Corbridge station, which has the original station house, with a small canopy attached to it on the right. We pass over a level crossing and then it becomes fairly flat on both sides as we reach 70 mph. There are sheep grazing on both sides, as we pass a large cement factory on the right and then start to slow down. The river Tyne runs next to us once more and then houses appear on the left, before extra tracks appear on the right. We go under the famous signal box, which straddles the line and then we stop at Hexham. The station is by far the largest on the line, reflecting its population of 12,000. Both platforms have large canopies on both sides and the yellow brick station building on the left has the Whistle Stop cafe within it, plus an Indian Takeaway next door. About twenty passengers get off. As we leave, we pass Hexham Abbey on a hill on the left, as well as plenty of small factory units on both sides. Then there is a large area of parkland on the right, which stretches to the banks of the river Tyne. Surprisingly on the left there is a caravan site, presumably for holiday makers who wish to holiday in the Tyne Valley. The river Tyne joins us once again on the right, before we pass under the A69. There are more sheep grazing on the right as we travel at a steady 40 mph. We actually cross the Tyne now for the first time since Newcastle. It is here that the Tyne splits into River North Tyne, which continues northwards into Northumberland and the Scottish border; and the River Tyne South, which we follow as far as Haltwhistle. The track curves to the left, as we pass through a wooded area. We are now climbing again and we pass a large factory on the left. It is also now raining and will stay like this all the way to Carlisle. For the first time on the journey, you can see cows in fields on either side of the track - quite unusual for this time of the year, as they are usually kept in sheds throughout the winter period. There are a few yellow stone houses on the right now and the river South Tyne below us on the left. We then pass through another wooded area, before reaching the summit of this particular hill. We reach 60 mph as the land opens up once more. It's still hilly in the distance though. We slow down, passing another semaphore signal, before coming to a stop at Haydon Bridge station. There is a big brown shelter on the right and the original station house on the left, with a signal box next to the level crossing. There's even an old black and white metal North Eastern railway sign to be seen here. As we leave we pass some modern looking terraced houses on the left before coming out into the countryside once more. We are climbing again now as we pass under the A69 and see the river South Tyne on our left once more. The A69 on our right looks pretty quiet though. We then speed up to 60 mph as cross over the Tyne and start to descend. We pass through a low cutting before crossing the South Tyne again and then it seems quite flat on both sides, with hills still in the distance. We cross the South Tyne once more and then stop at Bardon Mill station which has a strange shelter on the right. It is quite big, painted blue with an entrance at either end, but most of it is hidden from view. As we leave, the South Tyne is flowing on the left below us and we are travelling along the side of a hill on the right. It suddenly becomes quite bleak now as we pas through more sheep grazing country, with the odd farmstead in the distance. There is a large wood to be seen on the left as we reach 50 mph again and climb yet again. There are some terraced cottages on the right, but no station nearby. We go into a cutting and then pass through Whitchester tunnel, before emerging onto an embankment with the A69 on our right. There is another caravan site on our left and then the A69 goes over us on a flyover as we start to go downhill and then slow, passing some industrial units on the right. We come to a halt at Haltwhistle - if you'll excuse the pun. Apparently the name isn't anything to do with trains, but originates from the Old English for two streams converging. The station has split platforms just like Wylam station and has two large wooden waiting rooms on each platform, which look quite new. There is also a large red brick building on the right next to the station, which looks like it was once a water tower. There's also the original cast iron footbridge, painted red and white, as well as an odd piece of track going towards the station car park, which was once the goods yard. We move away into a cutting and then start to go downhill - this time all the way to Carlisle. Some of the fields here are flooded from the recent rains and the river South Tyne has moved away to the south now, going down to Alston which once had its own branch line. Some of this has been preserved as the South Tynedale railway. The A69 is on the left and we pass the village of Greenhead as we reach 60 mph once more. It is here that you can usually see part of Hadrian's Wall as it has become hilly again, but the fine rain has made it quite misty, so it is difficult to see it today. We also pass the village of Gilsland and more of Hadrian's Wall as we turn south east now. Normally you would see the mountains of Southern Scotland in the distance on the right, but today they are hidden by the mist. The scenery is now moor land with plenty of sheep grazing on either side of the tracks. The land eventually becomes flatter as we move towards Carlisle and we pass under the A69 once more, before entering another area of woodland. We pass through a cutting and descend more, passing some houses on the left, before slowing for Brampton station. It has a semaphore signal and the original footbridge, as well as a large blue wooden shelter on the right platform, again hidden from view. There is a much smaller blue framed perspex shelter on the left side. There doesn't seem to be any houses near the station, making it look like a remote country station. In fact the town of Brampton is about a mile away and used to have its own branch until the 1920's. We pass a wooded area on the right, before seeing more sheep grazing on either side. We speed up to 60 mph as we go downhill. After passing through a cutting and along an embankment it seems that we have finally left the Pennine Hills behind us, as everywhere is flat. We still seem to be descending though and it still looks sparsely populated. Eventually we slow and pass over a long viaduct which takes us over the river Eden and into Wetheral station. There is a large wooden waiting room on the right side, the same as at Haltwhistle and a cast iron footbridge. We enter another cutting, before emerging to flat countryside once more. We speed up to 60 mph as pass under the M6 motorway. Houses appear on the right and we slow down as a third piece of track appears on the right. We come to a stop by some sidings on the right. We wait here for three minutes before we are allowed to proceed. As we pull away the Settle & Carlisle line joins us on the left and a Virgin Pendelino train is waiting on the track on our right. A freight only line goes off on the left to join the West Coast Mainline which we then join. Finally, we arrive at platform 4 of Carlisle Station at 16.02, seven minutes later than advertised. About fifty passengers alight, many of them who have travelled from the Metro Centre. I have about twenty minutes before I have to catch the train back to Newcastle, so I pop out of the station to a nearby cafe and have a cup of tea. When I get back the train is locked with its engines on and about twenty people are waiting to get on. The guard finally lets everyone on with less than five minutes to go! Thankfully the train runs to schedule with no hold ups. Strangely the journey back to Newcastle seems to be much quicker than going!